Bingo, Bango, Bongo was inspired by many years of friendly golf competitions amongst friends. 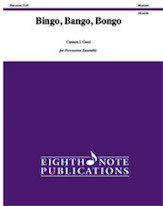 Specifically the name refers to the three ways to score points in the game represented in the composition by the many different groupings of instruments with emphasis on the bongo, conga, snare trio. Through approachable rhythmic notation players will enjoy the spectrum of sounds created by the various combinations explored in the piece. For vibraphone, maracas, timpani, snare drum, suspended cymbals, bongos, congas, shaker, bass drum, and castanets.